Life is a dance and you choose which dances you participate in… What a wonderful picture! This is a picture that my friend shared with me tonight. 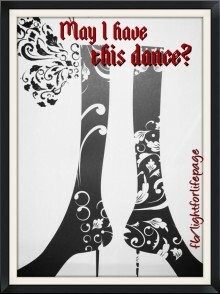 Will I choose to dance every time I am invited to participate? There are some dances we need to learn not to join in with. There are dances that we are so familiar with that as soon as we hear the music are feet start moving, even before we get up to take part, there is melody that we hum along with, but should we? There have been many dances in my life and many a dance that I have needed to bow out of…. but the other people sometimes can’t dance unless we participate and because we have done it so many times its not easy. The people we dance with are usually the people we love the most, they are close, and so in the familiarity we participate regardless of whether we really want to or not.I’m not really talking about dancing here of course, I am talking about how we live life. But is the habit really good for us? Is it right? People will always ask us to dance or they may just be dancing close by and we want to join in soits not necessarily their fault, but if this is not our dance then we need to learn to step aside or let them know this is not for us.Perhaps just by dancing regularly we will get better at the dance but in the end it still may not be beneficial for us. I am by NO MEANS a dancer. If someone asks me to do ballroom dancing I would more than likely trip up or injure myself. I am far more happier with the two step… but there are tunes that I have been dancing to that have worn me out. I will sit out the next dance! dance, habit, learn, lessons, life. Bookmark.